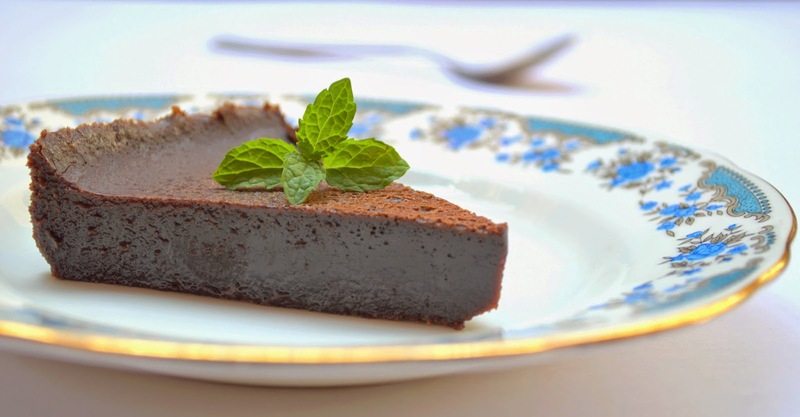 Cakes & More: Chocolate Idiot Cake - A Really Easy Flourless Chocolate Cake! 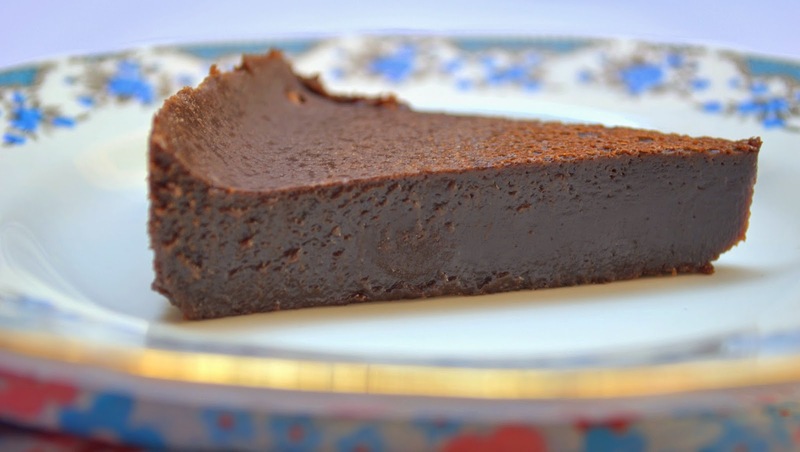 Chocolate Idiot Cake - A Really Easy Flourless Chocolate Cake! Admit it, you are amused and intrigued - Chocolate Idiot Cake ! DavidLebovitz obliterates any notions you may have about a consultant's job being a glamorous one. He says it mostly involves being called in at the last moment to restaurants to fix food issues when they go out of hand. Even more annoying, at times like this, people who work there don't exactly fall all over themselves to change anything. You now won't envy consultants, will you? So, when David worked as a consultant, he had to come up with a menu of fool proof cakes and desserts which were easy to make and impossible to muck up. Not just that, when you are not sure how long the desserts will need to be stored, the kinds that will keep well are a Godsend. Chocolate Idiot Cake - Chocolate Idiot Cake is one such easy cake which in David’s words 'tastes like the most delicious, silkiest, most supremely-chocolate ganache you've ever had'. Who in their right mind wouldn't be tempted to try this! In most flour less chocolate cakes the eggs are whipped to a volume before the chocolate mixture is folded in. But David's cake needs all the effort and expertise one would need to melt butter and chocolate, simply whisk in eggs and sugar. Baking in a water bath and then not over-baking the cake are the other necessary skills needed. 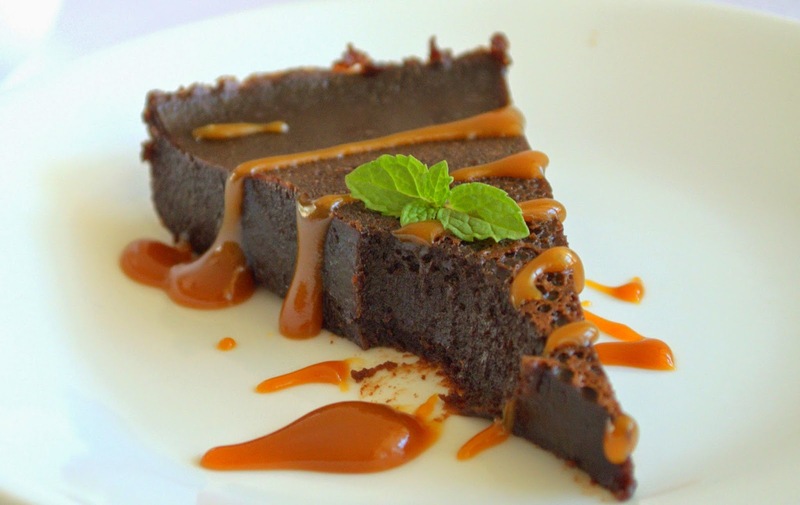 A cakewalk considering you will have in your refrigerator an undeniably rich, intensely chocolaty cake which is still good 2 -3 days after it is baked. Dinner party hostess or a busy dessert chef, you will find it handy to have this recipe in your repertoire. But be warned - this is not a cake for the faint hearted! Ingredients: So simple, you will soon know it by heart! Grease a 9'' round tin (spring form if you have. 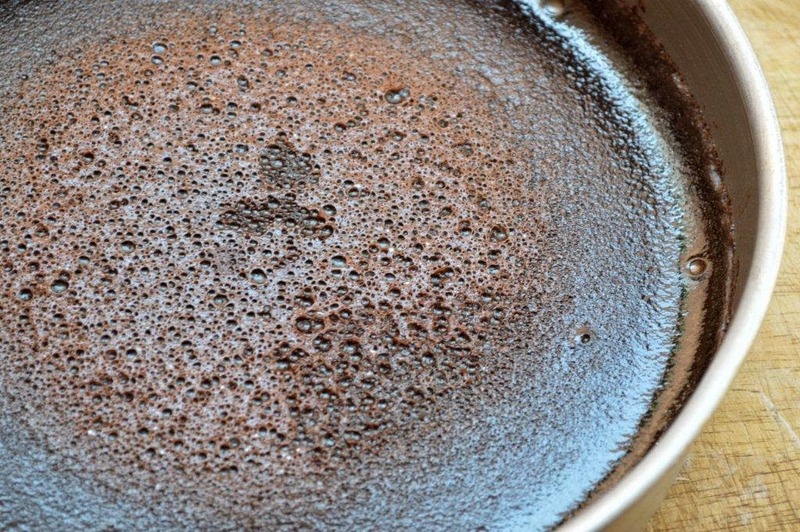 I have used a regular tin) Dust the sides with cocoa, tap off the excess. I have just used baking spray as I do not like the taste of cocoa here. Line the bottom with baking parchment. If using spring form, safer to wrap the outside too with two layers of heavy duty aluminum foil, such that the foil goes all the way to the rim. You will need to bake the cake in a water bath, so you will need another larger tin big enough to place the 9'' tin inside. I have used the large 12'' round tray which came with my microwave. Have some hot (not boiling) water on sim on your stove; there must be enough to come half way up the sides of the 9'' tin. Use a kettle if you have one. I have poured the hot water into the largest jar of my blender, lid tightly clamped and the funnel open to pour the water out. Worked! Be sure the butter is cubed and is very soft before you begin. Mix in the coffee if using. Have on hand a whisk, a spatula, a large bowl to whisk the eggs in. Also helps to have a steel fine meshed strainer over a heat proof bowl. You can push the melted chocolate and butter through this if you think its not smooth enough. Take a piece of heavy duty aluminum foil to cover the top of the 9'' tin snugly, roll the edges to keep it in place and make lifting easier. Two such pieces will be good to cover up in case you tear one when you lift to check. Have all ingredients measured and ready. If using a microwave to bake, melt the chocolate and butter in the microwave before you pre-heat it. Pre-heat oven to 180 degrees C / 350 F.
Melt the chocolate and butter in a saucepan set directly in a pan of simmering water. Right! Watch video at the end of the post for the easiest way to do this! Or melt in a microwave if you find that convenient. The mixture being smooth is very important to get the best texture, so careful here. Remove from heat. Push through the strainer if needed and cool. In a large bowl whisk the eggs, vanilla and sugar. No need to whip up a volume, just till homogeneous. Whisk in the melted chocolate mixture until smooth. Again no need to work up a volume. Pour the batter into the prepared tin and the cover the top with the aluminum foil. Place the 9’’ tin the larger tin and then put this in the oven. Carefully, pour the hot water into the larger tin. Bake till the cake is just set, the center still jiggly like jelly. The cake just sets, doesn't rise. If you gently touch the center, your finger should come away clean. With the tin still in the oven, just lift a corner of the foil up to check. I baked for 1 hour 5 minutes. The recipe says 1.15 minutes. Check after an hour, take the indicator as your guide. Err on the side of under baking as the cake will set further when you refrigerate. When done, lift the tin out the water bath, remove the foil on top and let cool to room temperature. Mine was still gooey when I tried to slice, so I refrigerated it overnight. Store the cake for 3-4 days wrapped well in the refrigerator. While at this, check this fab glass bottomed springform tin David uses. Envy! Please note: Since chocolate is the star here, use good quality chocolate if you can. If you use good quality bittersweet/ semisweet chocolate, the cake may taste just right. Since I have used a local brand Morde and did not want to reduce the sugar, I have added coffee to temper the sweetness. It would surely taste better with better quality chocolate. If bittersweet is your love, this cake is surely worth a try. We enjoyed this creamy, very indulgent dessert. Which chocolate adoring idiot wouldn't? Watch video - The easiest way to melt chocolate! so creamy.. and rich and luscious!! and with those pics upfront.. you can almost dive into it!! It reminds me a bit of this cake I once tried from the 'baking with Julia' book... called Boca Negra!! 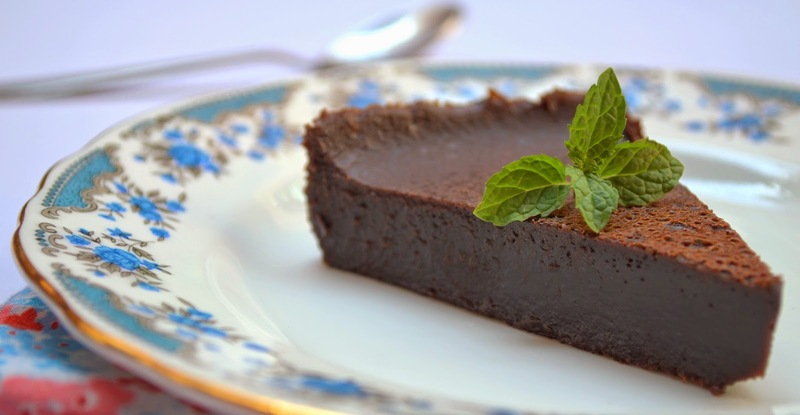 That's an awesome recipe for chocolate lovers and a go too recipe when in hurry..can I take a bite?yumm!! !thanks for posting. Woww.. Looks so rich and delicious.. awesome presentation!! Delicious and lovely looking cake. Even the name makes it sound so intriguing. Cant take my eyes off from the last picture,irresistible..